On 19 July 1870, the French Empire declared war on the kingdom of Prussia. 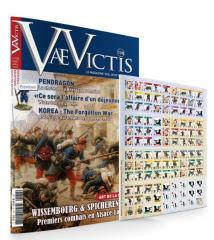 Wissembourg, on 4 August, was the first battle of the war and the first French defeat of 1870. Opposing three corps (one Bavarian and two Prussian), Douay's division held the town and the heights of Geisberg until early afternoon before yielding to the mass. In Spicheren, on 6 August, the 2nd French corps had a good position and blocked the Prussian troops into the night at the risk of being outflanked. Their retreat was ill-prepared and caused the rest of the Lorraine army to retreat to the walls of Metz. Returning to the series “The Great Battles of Napoleon III”, (VaeVictis #55 and #73), the system is simple and dynamic and focuses on the engagement of the troops against deadly defensive fire. Scenarios by Arnold Giraud-Moser with a system by Luc Olivier.